Democrats love the freak show. And Robert O’Rourke is a complete and total freak. The fact that Robert O’Rourke believes he’s capable of being president proves his “freakishness”. And his candidacy slaps the Democrats in the face. O’Rourke is a pervert joining other perverts. In what should be a wake-up call to their party, Democrats appear to welcome O’Rourke’s candidacy and the side-show circus act it showcases. But O’Rourke’s candidacy spotlights the cast of misfits and miscreants who make up the Democrats’ potential leadership. In fact, compared to many of the others who believe they can unseat President Trump, O’Rourke looks rather normal. Take Elizabeth Warren for example. Once considered a front-runner, Warren sunk her chances as she claimed genuine Indian heritage. She profited from that stolen history, yet recently decried the two Hollyweirdos helping children of the rich and famous get into the best schools. Surely I don’t need to explain the irony and hypocrisy of Warren here? Even more ironic, the woman who stole identity and culture for her own riches now promises reparations, if only blacks are stupid enough to support her. Speaking of reparations, what of Kamala “Sleep my way to the top” Harris? What an example of the #MeToo, #ImWithHer and other feminists movements?! Not to mention, the woman now campaigns on reparations for blacks knowing that her family owned one of the biggest slave plantations in Jamaica. Another freak is Senator Cory “I’m not gay” Booker (D-NJ). His perversions involve public beatings of white women, for starters. In the video below, Booker admonishes Secretary of Homeland Secretary Kirstjen Nielsen. She apparently forgot President Trump’s comments in which he reportedly referred to Haiti and African nations as “shithole countries”. Booker said her “silence and amnesia is complicit”. Booker loves to grandstand, as we learned during his Spartacus moment. And now we learn that the sexual-orientationally-ambiguous Booker has a new girlfriend. Perhaps the Democrats’ biggest freak is their new front-runner for 2020. 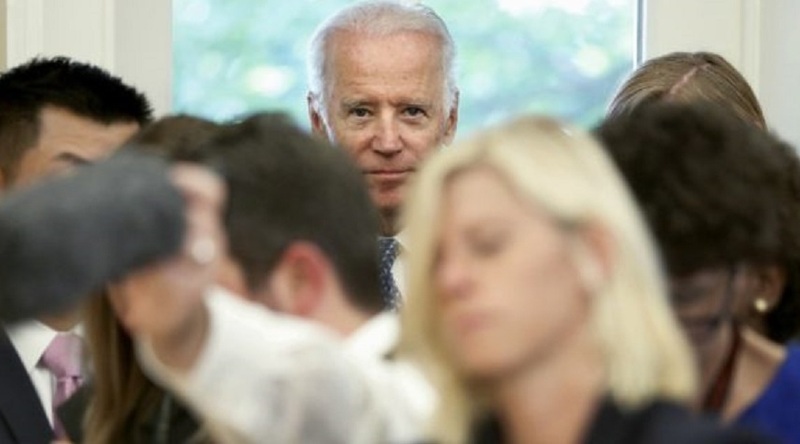 The geriatric former VP “Creepy” Joe Biden stalks women all over DC. But if Biden’s open sexual abuse of women isn’t creepy enough, there is his recent mea culpa to blacks for being too tough in criminal justice reform. He saw how this played for Hillary Clinton, so he panders early. Next, there is the man who should have beaten Hillary Clinton. Democratic-Socialist Bernie Sanders got rich in the last campaign. Yet he still campaigns on poverty. O’Rourke is a younger dumber version of Sanders. But he’s smart enough to know how to milk Democrats of their not so hard-earned money. Leftists should be ashamed to have a flim-flam artist in their party. But some will see O’Rourke as a serious candidate. I predicted O’Rourke would be too embarrassed to put his record on the main stage. However, I also said that if he’s the scam artist I know he is, he will see the potential for profit in a presidential run. We find ourselves with the answer. O’Rourke posted a video to social media last week announcing his 2020 presidential bid, which has been rumored for some time. Even if O’Rourke is the break-out candidate the Dems are desperately seeking, he still doesn’t stand a chance. Remember, Trump already mopped the floor with O’Rourke. In October, Trump campaigned for former-foe and then-O’Rourke opponent Senator Ted Cruz (R-TX). During a speech backing Cruz, Trump called the Republican’s Senate challenger a “stone cold phony named Robert Francis O’Rourke, who is sometimes referred to as Beto and pretends to be moderate,” reported Deadline. Believe it or not, this actually makes O’Rourke as prepared to be president as Obama. And Pelosi seems to back him. Nancy Pelosi was asked what Beto's "signature accomplishment" was in Congress. She couldn't name anything specific. Besides pretending he’s a Latino, O’Rourke does have a strategy. He wants to impeach the president. I guess technically if he could get rid of Trump, then that makes things easier. Democratic presidential candidate Beto O’Rourke said during his campaign against Sen. Ted Cruz in 2018 that he thought President Donald Trump should be impeached, but now he thinks that maybe the best way to unseat the president is at the ballot box in 2020. He added that he thinks it’s “beyond a shadow of a doubt” that even if there was no collusion, there was the effort to collude, and that there was “certainly” the effort to obstruct justice. Regardless, O’Rourke has NO chance of being president. He’s a grifter, like most Democrat leaders.